Preheat the oven to 200 F. Spread the almonds and pistachios on a large baking sheet and keep warm in the oven. Line an 8-inch square baking pan with parchment paper, allowing the paper to hang over on two opposite sides. Lightly spray the paper with vegetable oil spray. In a bowl, combine the cornstarch and confectioners’ sugar and dust the pan with half of the mixture. In a medium saucepan, combine the 1 ⅔ cups of granulated sugar with ¼ cup of the honey and the water and bring to a boil. When the temperature of the syrup reaches 245 F on a candy thermometer, after 20 to 30 minutes, bring the remaining ½ cup of honey to a boil in a small saucepan. Continue cooking the sugar syrup. When the pure honey reaches 265 F on a candy thermometer, after 5 to 8 minutes, add it in a fast, steady stream to the egg whites with the mixer at medium-high speed. When the sugar syrup reaches 305 F, add it to the egg whites in a fast, steady stream and beat at high speed until the mixture is pale, 3 to 5 minutes. Using an oiled wooden spoon, immediately stir in the hot nuts (the nougat will be a bit stiff). Lift the nougat from the pan and brush off the excess cornstarch powder. 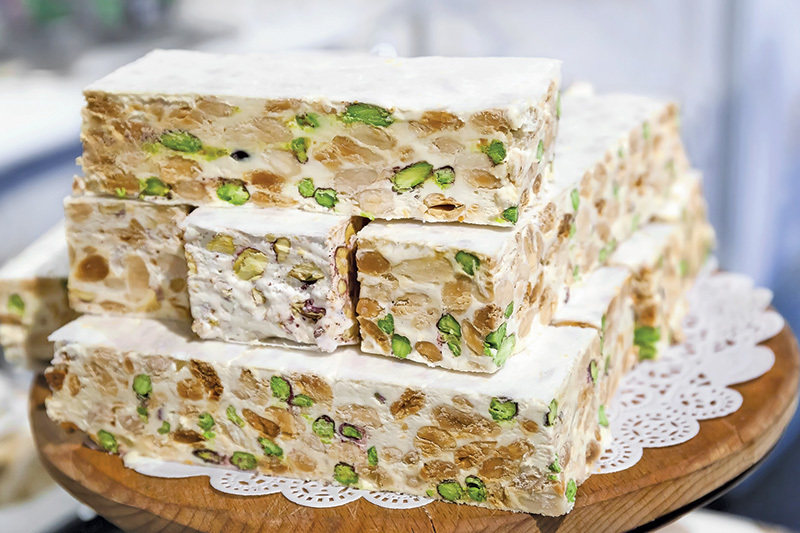 Using a serrated knife, cut the nougat into ¾-inch slices. Cut the slices in pieces and serve, or wrap in wax paper and store in an airtight container for up to 2 weeks.